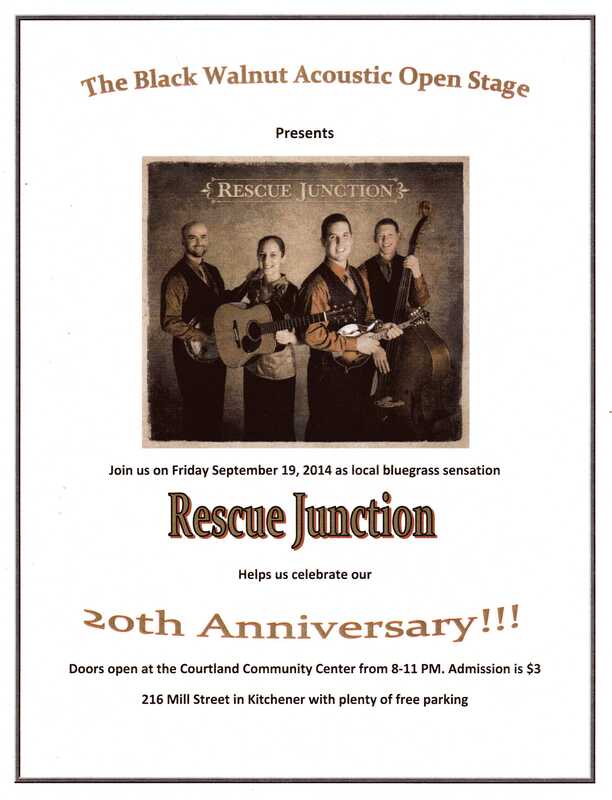 On Friday, September 19, 2014, the Black Walnut Open Stage will welcome the sensational bluegrass group, Rescue Junction to help us celebrate the completion of 20 years of hosting live, acoustic music in Waterloo Region. For this special event, there will be no Open Stage. The next Open Stage will be October 17th. On Saturday July 6th at 7pm is the 13th annual Summer Campfire at Jim’s place:in St Clements, Ont. for more info or directions call Jim at 519-699-4520. Time: Gathering at 7 pm, music usually starts about 8 pm AND remember no more Black Walnut at the Community Center Until September. Updates will follow soon. Read All About the Open Stage on May 18th. On Friday May 18th, 2012, the Folk Club was an All Open Stage. It was one of our better turnouts this year and the variety and entertainment was terrific. On a sadder note, a bike that was parked in the Hallway was reported stolen during the evening. There are lots of times when nobody from the club is in the hallway so there is a risk for any property that is left outside in the hallway. I am not aware of any previous incident like that, but it could happen again, so be warned. Sometimes we have such a good time we don’t notice when one or two people are really messing things up for numerous other people. That is when people complain, and that is what they should do. Last month we had a couple of songs that were had offensive language and or subject matter. We arent going to identify them here. The other thing is that one performer used twice as much time as most people to do two songs. It was way more than 10 minutes. 8.We will probably not let you know how much time you have left after you finish your first song, unless you ask. If you have less than 3 minutes left you probably should not start another song. To help you out with this, understand that if your songs are each more than 4 minutes long, you probably won’t have time for more than one song, because it always take at least a minute for you to get on-stage and ready to start your first song. On Friday October18, 2011, The Black Walnut Folk Club was host to twelve open-stage acts plus some rare encores. There were two Black Walnuts first-timers and some guests who don’t make it out to our club very often. Where was everybody else? We may never know. Next Month we will start off with a feature length set by Scott Abrams. Scott is a native of Niagara Falls, New York and has been entertaining audiences with his eclectic collection of folk music for over 25 years. He has been treating us to his diverse collection of songs and very expressive guitar and vocals for what seems like a couple of years now and we are really looking forward to his set on Friday, December 16, 2011. The Mill Race Festival of Traditional Folk Music in Cambridge, ON will feature sing-a-rounds at The South Waterloo Naval Veterans Hall. 30 Cambridge Street (@ Thorne Street) on Saturday July 30 and Sunday July 31 from about 1 pm – about 5:30 pm. The Black Walnut Folk Club will host those on Saturday from 1-3pm, hosted by Don Sawchuk and again on Sunday from 3-4:30pm, hosted by Jakki and Wayne. If you wish to lend a hand or sing along just meet us there. If you want to bring an instrument but don’t want to carry it around all day or leave it in your vehicle, you can deposit it for safekeeping at the the Festival instrument lock-up at the Cambridge Centre for the Arts on Thorne Street. It is a terrific festival and it is free. For more info on the festival please check out www.millracefolksociety.com and buy a program. Other BWFC regulars will be involved and performing including Terry Golletz/Zubrivka, and Bob MacLean.